How are all those typewriter enthusiasts now going to be able to get their machines repaired? Probably a few traditionalists will be able to get by by cannibalizing old typewriters for a few years. My neighbor at work, Bette Thresher, tells me that she goes round garage sales buying golf balls* for her IBM Selectric. I never had a relationship with a typewriter. When I was at school and university in Britain we were not allowed to use typewriters for our weekly essays — in contrast to the American experience — so I never learned to type until we got computers at work, which was probably in the late eighties or maybe early nineties — so recent, so revolutionary, and so forgotten! I still hunt and peck, but some frequently-used sentences roll off the keyboard at a speed which impresses me, if not perhaps my neighbors. Most of my colleagues have never worked in a typewriter environment, and know nothing of the charms of carbon paper and onion skin for multiple copies — yes, we didn’t have Xerox copiers either. Let us also memorialize the Typing Pool, a sizable department where high-speed typists banged out letters, memos, contracts etc. from dawn till dusk. Posts below which include something about the typewriter are Upper & Lower Case and Disintermediation. * the golf ball is the removable set of characters used to create the image. 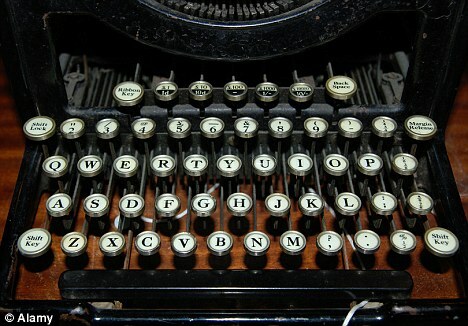 Older typewriters had one set of characters only (traditionally Courier), but the golf ball enabled Selectric owners to have access to multiple fonts.